“I’m no fool, Mum,” Katie said gaily. Others might disagree, but foolish as she sometimes was, Katie was also an agreeable girl. She set off happily beneath the bright sunshine, carefully carrying the basket of eggs. As she walked along, Katie began to dream of the money she would earn for those eggs. She was walking along and humming a happy tune when she happened to spot a wee lad sitting by the side of the road. He was sewing away at a brogue, a fancy shoe. As soon as she saw that, she knew he must be no ordinary boy. Surely he was a leprechaun. She stopped and stared. She saw that he was a fat little fellow with a round, jolly face, and his cutaway jacket was red with seven buttons in a row. His shoes were shiny, and his face was as wrinkled as an old man’s. Katie knew that leprechauns were busy forever mending shoes. But most importantly, she knew that anyone who caught a leprechaun would be led to a treasure, for leprechauns knew where treasures were buried. She crept up behind him as delicately as a cat. When she was close, she reached out with one hand and grabbed him tightly by the neck. “What’s that?” he turned and cried. He was startled by the sight of the girl and her long red braids, big bonnet and sunny smile. She took a firm grip around his neck. “I’m afraid of no frogs,” Katie said. She thought about the frogs that hopped in and out of the pond beside her house. Imagine being afraid of a frog! She nearly laughed out loud but didn’t, for this was serious business and she was about to be rich. Now her mother would be proud of her. She’d never have to work another day. No more carrying eggs to market; no more milking cows; no more cleaning out barns or mending clothes or baking or sewing or scything. Ah, what a life of leisure little Katie would lead! She could just see her beautiful dresses and the glorious carriage that would take her from here to there. She envisioned the big house she would buy with all her gold. She would have servants, fancy feasts and lots of land. “Well then?” asked the leprechaun. “I’ll just sit upon your basket handle and show you the way to the treasure,” the leprechaun said. “That’s good!” Katie said. She let him sit upon the handle of the basket, though she kept a firm grip on his arm. “Turn left,” he said, and Katie turned left. After they had walked awhile, he said, “Turn right,” and she turned right. They walked up a steep hill and down into a valley. The sun beat down, and Katie was warm indeed. But she didn’t mind. She was on her way to a treasure, dreaming of a fancy life! “Turn left again,” he said. Up another steep hill they climbed. 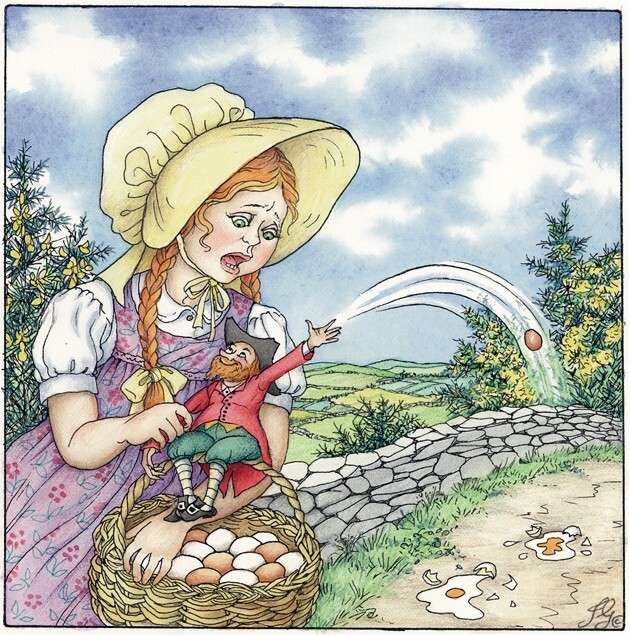 As they reached the very top of the hill, the leprechaun reached into the basket and tossed an egg over Katie’s shoulder. But just as she said that, the wee lad reached into the basket and tossed another one behind her. “Almost,” said the leprechaun, and he tossed out another egg. And then he tossed another and another and another. “What are you doing to my eggs?” Katie cried, turning to look at those eggs lying broken in the road. But as she turned, she loosened her grip and the leprechaun slipped from her grasp, springing into the bushes. By the time she had turned back, he had vanished. “Ah no!” Katie cried. She was terribly disappointed. She looked everywhere, but she could not find that wee man, and there were no frogs in sight, and now most of her eggs were broken. And so Katie cheerfully walked back home with no money for her mum, as foolish and agreeable as ever.